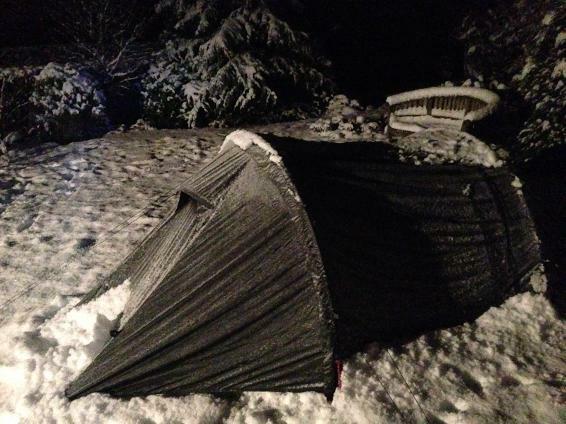 I have so far used the Trolhetta in some very typical (rubbish) Scottish winter conditions and have found it to be a very good tent. It is very easy to put up and stable in high wind speeds. 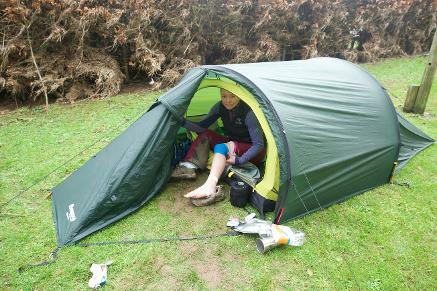 The fabric has a shiny texture which makes it very easy to pack into small spaces and the tent bag is also roomy, although the compression straps make it more long and thin as opposed to usefully small, but a stuff sac could easily be used instead. The poles are very light, easy to feed through sleeves and snap together fairly efficiently. The tightening systems at the base of the pole inserts means only visiting one side of the tent to put both poles in and means no battling to get poles into the holes! The tightening system on the guy ropes makes stabilising the tent very quick and easy. They are also light reflective! The inside colour being yellow gives the tent a nice vibe (very important). Left top: Ok, saggy outer that day. Left bottom: Nice vibe inside with good head room. Above: The Trolhetta after withstanding a very heavy snow dump. The only real drawback is a slightly saggy inner compared to outer, improved hugely by tightening the guy ropes well, but it still remains a little difficult to get rid of the wrinkles. Tightening the internal elastic attachments helps but these have to be undone when dismantling the tent as this otherwise makes the poles hard to feed through the sleeves. However, functionally, having a wrinkly roof is not really a problem. 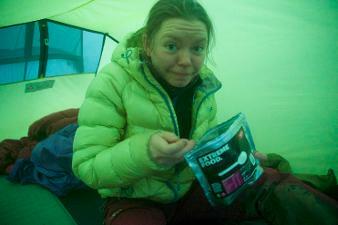 Overall, I love the lightweight and easy nature of this tent and trust it to hold up in bad weather conditions. I was excited to be asked by the guys at Hotaches last week to review their latest film, Redemption. I watched the film three times back to back, thoroughly enjoyed it and this is what I came up with. Climbing grades can always be relied on to provide a source of contentious debate amongst climbers and at a professional level, particularly when putting up new routes, grading correctly is pretty important to get right. Perceived errors can be met with fierce response from the climbing community, which is exactly what James Pearson, a world class trad climber from the UK, received when he put up what he thought were some of the hardest trad routes on grit during the naughties, only for them to be downgraded by several grades shortly afterwards. James also criticised the difficulty of Dave MacLeod’s Rhapsody, E11 7a, Dumbarton Rock, Scotland, without completing the route. He continued to climb Walk of Life, a long and dangerous trad route in North Devon, originally graded E12 7a by James, but later downgraded to E9 6c by Dave MacLeod. 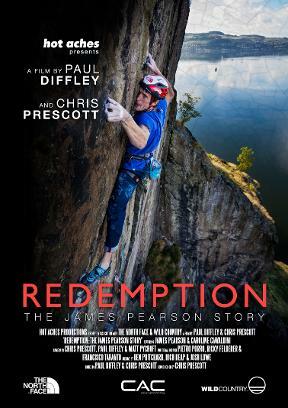 Redemption is a film about James’ story and the effect that this difficult period had on him. For the first time, we're able to understand his point of view and get an insight into the process of how he came to believe that his grades were correct. His account is honest and his character is of a likeable and humbled individual, regretful of mistakes made as a youngster. After feeling that his climbing career was falling apart, James left the UK for several years, only returning recently to face Dave’s route and try to put things right. As well as being an immersive story, Redemption includes some of James’ hardest and most dangerous ascents through a mixture of archive and recorded footage. Expect close shaves, sketchy run-outs and humongous whippers!